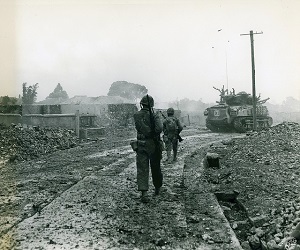 This QPME guide provides information and learning resources about the United States Marine Corps role in the Battle of Okinawa, the largest amphibious assault in the Pacific War during World War II. 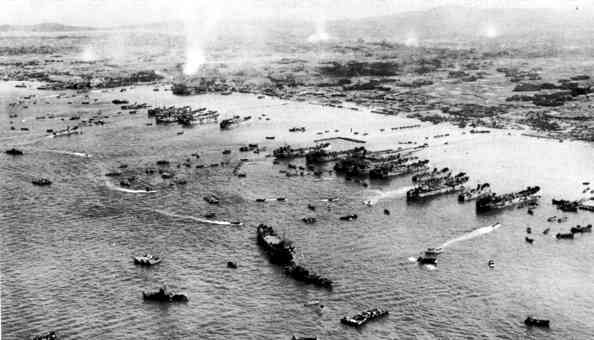 By mid-May 1945, the Okinawa campaign had already lasted longer than the fight for either Iwo Jima or Saipan, and most Americans on the island, from the lowliest privates on up to Lt. Gen. Simon Bolivar Buckner Jr. and his division commanders, could tell that the end of it was nowhere in sight. ~ "Mud, Blood, and Mayhem: In the Grisly Battle for Okinawa". World War II. This QPME guide provides information and learning resources about the role of the United States Marine Corps in the Battle of Okinawa. Our aim is to help Marines understand the battle that ultimately proved to be the last battle of World War II. We also hope to convey a sense of the impact of the battle on those who were there, and its legacy to the Marine Corps. This guide enables Marines to explore links to both online and offline primary and seconday resources on the campaign, learn about key players and Medal of Honor recipients, and study maps and view images of the battle codenamed Operation Iceberg. Need help? Visit our Contact Us page. Tanks and infantry of 6th Division enter Naha City. Okinawa, 30 May 1945. 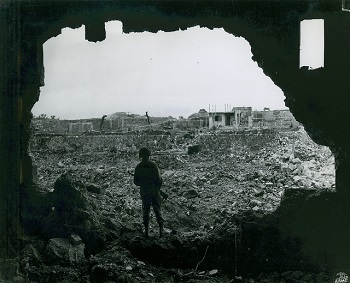 A Marine rifleman views the result of the American bombardment of Naha.